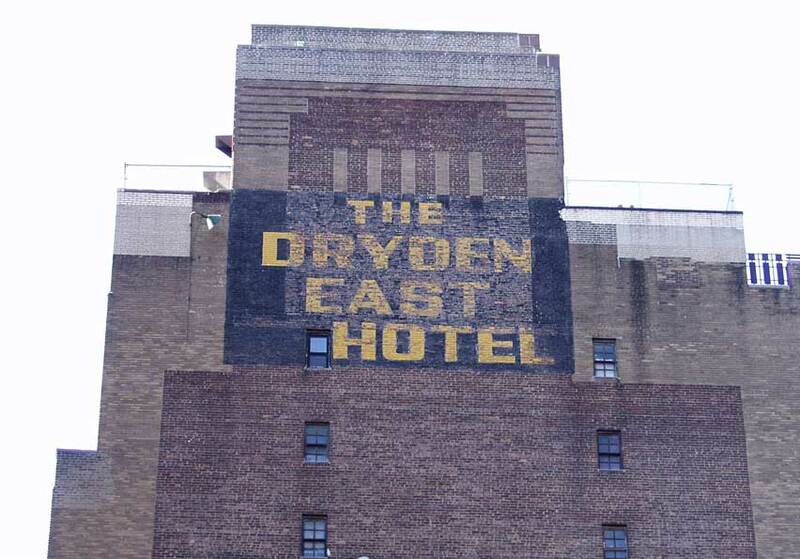 The original plans for the Dryden East Hotel were filed with the New York City Dept. of Buildings in 1927 for a 16-story brick hotel building at 148-152 East 39th St. by 148 E. 39th St., Inc., Joseph A. Moller, president, of 51 E. 42nd St. The architect was Henry Ives Cobb, Jr., 51 E. 42nd St. ("Manhattan NB Database 1900-1986," (10 March 2010), http://www.MetroHistory.com). The Dryden was known as the Hotel Dryden until the early 1960s, when the name changed to Dryden East Hotel. As of March 2010 the Dryden does not seem to function as a hotel. Internet listings seem to indicate that the building now consists of rental apartments. This classified ad for the Hotel Dryden appeared in the New York Times, 24 April 1954, p. 32.